Trying to select the best camping gear for your outdoor adventure travel? Here are related questions from Love To Know Camping's readers and responses from our resident expert. We have an older version of the Coleman 425 camping stove (the red cylinder thingamajig is inside). What kind of fuel do I use if we go camping in a couple of weeks for the first time in years? The stove you are describing uses Coleman camp fuel. It comes in a can and is specifically designed for camp stoves and lanterns. It is a liquid fuel that is poured into the red cylinder. Most outdoor supply, REI or general-purpose stores sell it. There's a good chance that even the WalMart in your area has the right type of fuel. If you haven't used your stove in a long time, it's essential to try it out at home before taking it camping. When testing the stove, ensure there is a good blue flame. That is a sign all is properly functioning and burning safely. Occasionally parts of the stove become clogged and it won't function properly, so it is better to know that before you get stuck in the woods with no way to cook. If you find it doesn't work, most outdoor stores sell parts to fix these Coleman stoves as they are very common and easy to fix. I have just bought a Wynnster Brecon 8. It is new in the box but about 3 years old (I think). I can't buy the ground sheet anymore as the tent is an unusual shape. What ground sheet size or make would you recommend? The tent has a sewn in ground sheet, so we would be looking for a footprint stone protector type ground sheet for underneath. When choosing a ground sheet, the major factors you need to consider are getting one that is large enough for your particular tent and made from a durable fabric. I tend to prefer those made from PE rather than PVC options, but many people prefer PVC. Outdoor Megastore is a UK retailer that offers a wide selection of ground sheets (I assume you are in the UK based on your contact information). They even offer the newer Ecotec Carpet Pre-Packed Groundsheets, which many people concerned about the environment prefer to PE or PBC. Enjoy camping in your new tent! The groundsheet with a 5000 hydrostatic rating is designed to provide greater protection than those with lower HH ratings. Tents marketed with 5000 HH groundsheets are pitched as ones that ensure or are guaranteed to keep the tent dry inside. In most conditions, you probably won't notice a difference between the two tents. However, if you're camping in extreme conditions, yours might do a little better. We do hiking trips on trails and we camp on the trails. What is the best food to take along on this kind of backpacking and camping trip. We are usually gone for 2 -3 days at a time. Dear Cheryl, Packing wisely is certainly important when planning a backpacking and camping trip. You need to focus on taking nutritional food items that won't take up a lot of room in your pack, are non-perishable, and are easy to prepare. See Backpacking Meal Suggestions for an article about food considerations for trips such as the one you are describing. It's full of specific ideas for what types of foods to take, how to pack and store them, and where to find them. I need a tent that will stay cool in the humid South Alabama climate. Do you have any suggestions? There really isn't a tent that will stay cool on its own in a hot climate. There are things that you can do that will make dealing with the heat a little more bearable, though. Assuming that you go camping in areas where you have access to electricity or a portable generator, the best way to keep your tent cool in hot, humid weather is with a portable air conditioner. My father-in-law actually did this many years ago with a canvas tent. He built a stand that would hold a window unit, created a cutout in the tent, and had instant air conditioning. Many people who live or camp in areas with extreme temperatures choose to move up from a tent to a popup tent trailer so that climate control becomes less of a hassle. These units often include built in air conditioners and heaters. The heater probably won't be a concern in your area for most of the year, but for many campers it is a necessity. The built in air conditioner can certainly keep you cool without having to worry about finding a way to get cool air circulating in a tent. My hiking boots are over fifteen years old, so I assume it is time for a replacement. I am an avid hiker and occasionally enjoy backpacking. I want to find a good new pair of boots, but honestly don't know where to start! There are so many on the market these days. I do need ones that are waterproof as I live in a wet climate. Any ideas on how to start shopping, what to look for, and good brands? 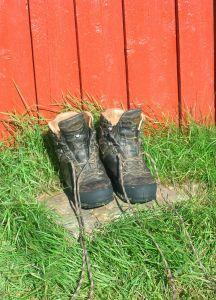 I'm really impressed that you have had the same hiking boots for 15 years. If the manufacturer who made that pair is still in business, you may want to stick with the same brand! You'll find that the basic design of hiking boots hasn't changed much over the last 15 years, but the materials with which they are made have greatly improved. Several companies make waterproof hiking boots. I have a pair of Gore-Tex hiking boots that I use any time I am hiking or camping in wet areas, and I recommend them highly. I don't think that there are any better options than Gore-Tex for waterproof camping gear. There are many good brands of hiking boots. I currently have hiking boots made by Vasque, Cabelas, and Coleman, and am pleased with all three pairs of them. Be sure the boots you select are really intended for serious hikers. To find hiking boots that are recommended for use in your area, you may want to start by checking with local outdoor specialty retailers. It's likely that they carry brands commonly used by dedicated hikers in your region. This can be a very beneficial way to narrow down your options. You may be surprised to find that the prices offered by outdoor specialty companies are just as affordable as discount or online shopping options. Happy shopping! I hope the next pair of hiking boots you select is as durable as the ones you currently have.